It’s a short appearance in the film, but actor Joe Cortese makes an impression right at the beginning as mob man Gio Loscudo. Cortese has starred in films such as Monsignor, Ruby, American History X, Windows, The Rat Pack, and The Death Collector alongside Joe Pesci. You have a short time in the film but it’s such a memorable moment. It’s probably the smallest part I’ve ever had to do in a movie and I’m pleasantly surprised at the response I’ve been getting. You know who he sort of reminded me of, Santino Bonati in Lady Boss. Oh wow, that’s years ago. I’ve played a lot of those characters. My first movie was in The Death Collector with Joe Pesci and it’s actually one of Tarantino’s favorite movies. I’ve played many different characters and that’s one that I have in my pocket. People are really responding to this film. I’m just surprised by it all. How did Green Book happen for you? I had just finished playing Armani in Versace. It was a delicious part and right before it was released, the whole thing ended up being cut. Then they said they were going to change it to the head of the Gambino crime family. I knew a little bit about that. I’ve done all my research and consider myself to be a bit of a Mobologist. I go in and realize that Nick Vallelonga was someone who I’d done a play with him in the Valley when my son was being born. This was over 28 years ago. I’ve actually known him a while and hadn’t seen him for about six months. He says hi and introduces me to Peter. I read and that night Nick calls me and says that Pete canceled all other reads for the character. And there’s a story about the hat. Do you want to share that? It’s such a great story. I actually knew Tony Lip because of Nick and Tony used to act in The Sopranos. 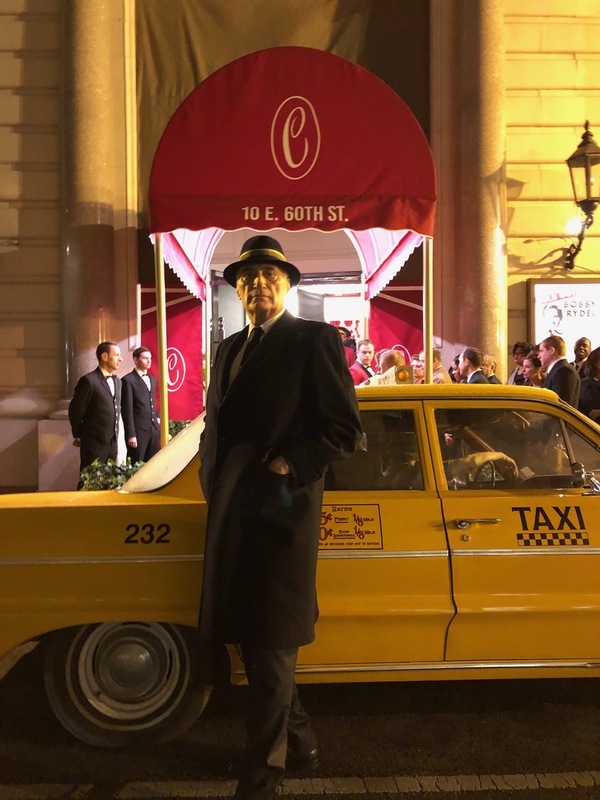 What happened originally was that Frank shows ups at the Copa in 1962 and like in the movie, he gives the hat to the coat check girl. She takes it. He gives her and everybody a tip and he walks in. He comes back. Tony Lip goes to the hat check girl and says, “Give me the hat.” He gives her $10.00 and then Sinatra comes out and goes absolutely batshit. He says, “I’ll burn this joint down.” He goes around the corner to Jilly’s owned by Jilly Rizzo. It was a great period in American history that era. Anyway, Tony Lip gets the hat, shows up at Jilly’s and throws the hat on the table and says, “I got your hat.” Sinatra loved getting the hat back and gives Tony a $100 bill which is what he wanted. All is good because he has money to give his family. They go on to become friends. Coppola walks in and later he goes on to cast Tony in The Godfather and that’s a great story. Back to the film, I shoot my scene and I get along really well with Nick, Peter, and Viggo. It was a great experience just being there. I was so honored that Viggo did that. He’s one of the best actors I’ve ever worked with.